What an amazing time Dave and I have just enjoyed with our friends from Thembalezizwe Church, Bulawayo, Zimbabwe. They were so pleased to see us and receive greetings from our church to theirs. The school was buzzing with 21 new children pictured above with their teachers Uncle Mathias and Aunty Samu and wearing their new track suits we bought them while we were there. It is usually quite warm in January but this year the rains have been very heavy and the temperature was only about 17 degrees. 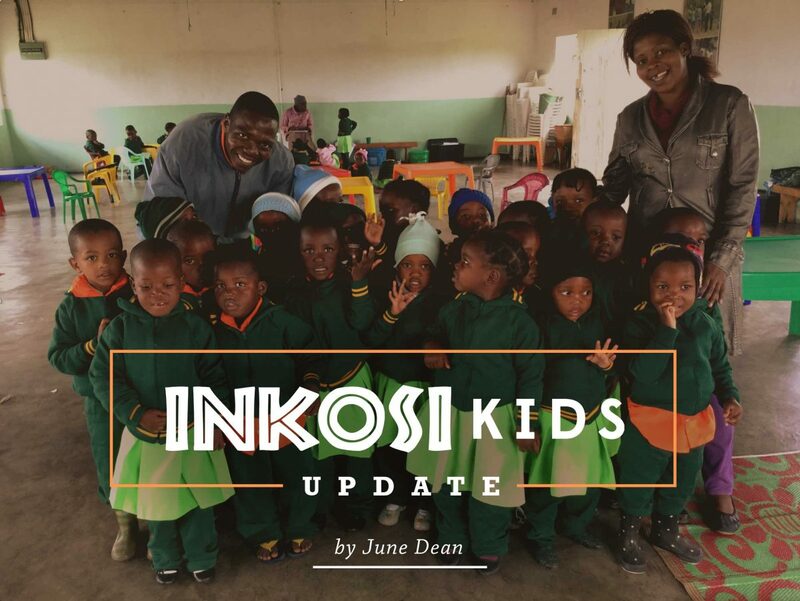 The older children are pictured on the left with Aunty Ma Phiri and Aunty Tendai. Some of my time there was taken up with talking through the new curriculum recently drawn up by the government and by trying to help the staff to make some sense of it and understand the changes they will need to make. As well as this, I was also able to have fun playing with the children at every opportunity! As you may know, the economy of Zim is in a very bad state, which means that people who had very little to begin with are struggling to survive on a daily basis. Through the generosity of Kings members we were able to help several families with food and medical bills and in some cases, money for uniform and books for school. 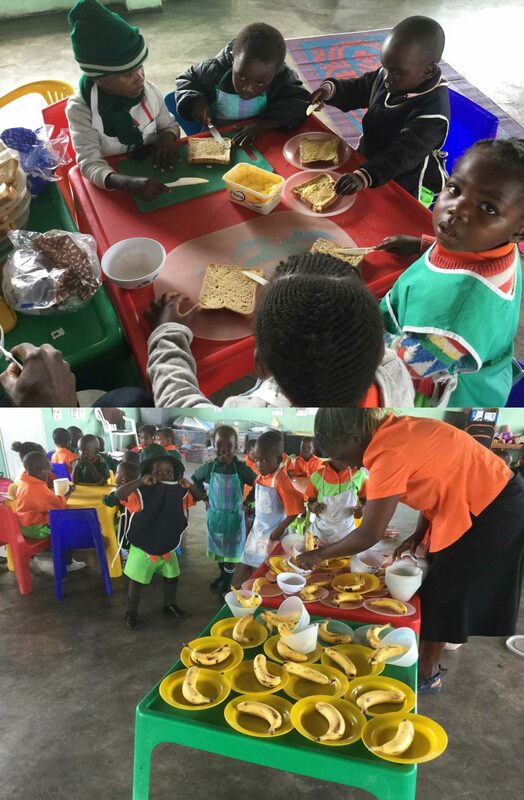 We were very keen to catch up with the old pupils from ECD, all of whom are now in the local Primary School, so we invited them to a tea party after school one day. All but about 5 came and it was lovely to see how they had grown. They sang for us and really enjoyed their food. 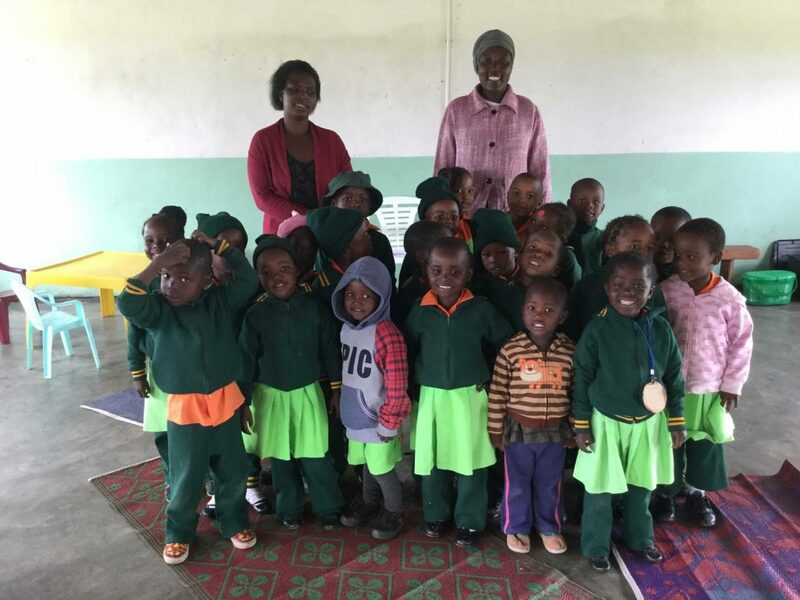 We also visited their Primary school and were very proud to hear from the Head teacher that the highest achieving children in grades 1, 2 and 3 are all from our ECD. 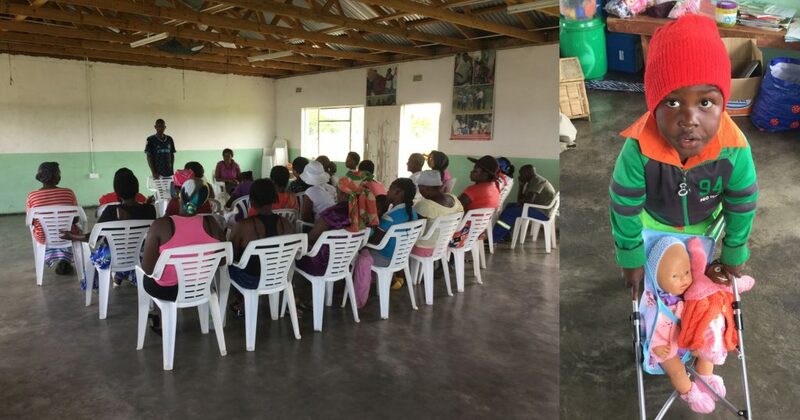 We were very sad to hear that a few of our sponsored children are not attending school as regularly as they should, so we called a meeting of parents (see below) so that Taurai, the pastor, could set in place a few ground rules. 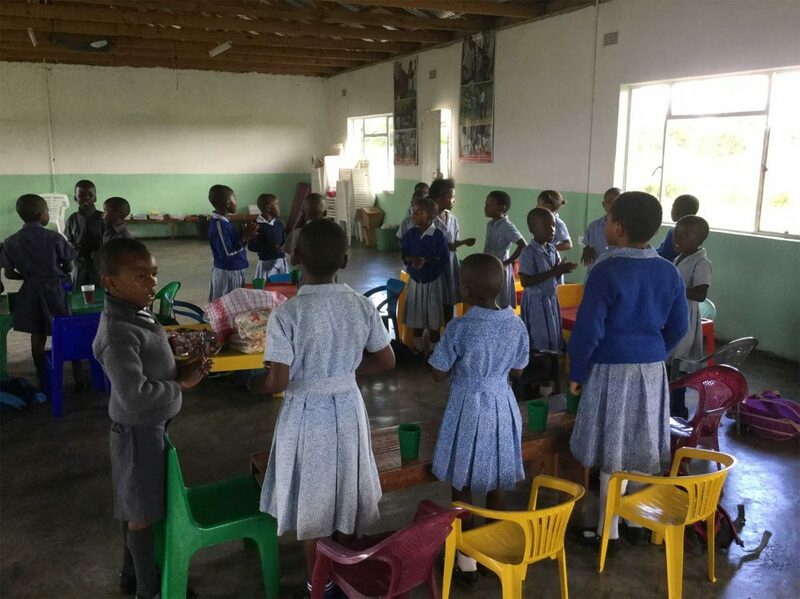 The parents were very open to the suggestions and the staff will liaise with school on a monthly basis to find out if children are not regularly attending and they and the pastor will home visit, if necessary, to establish the reason. Sometimes it is simply that they genuinely cannot afford pencils and books although at other times it can be that a Dad is spending their money on beer or they are sending the child to work somewhere for extra income! 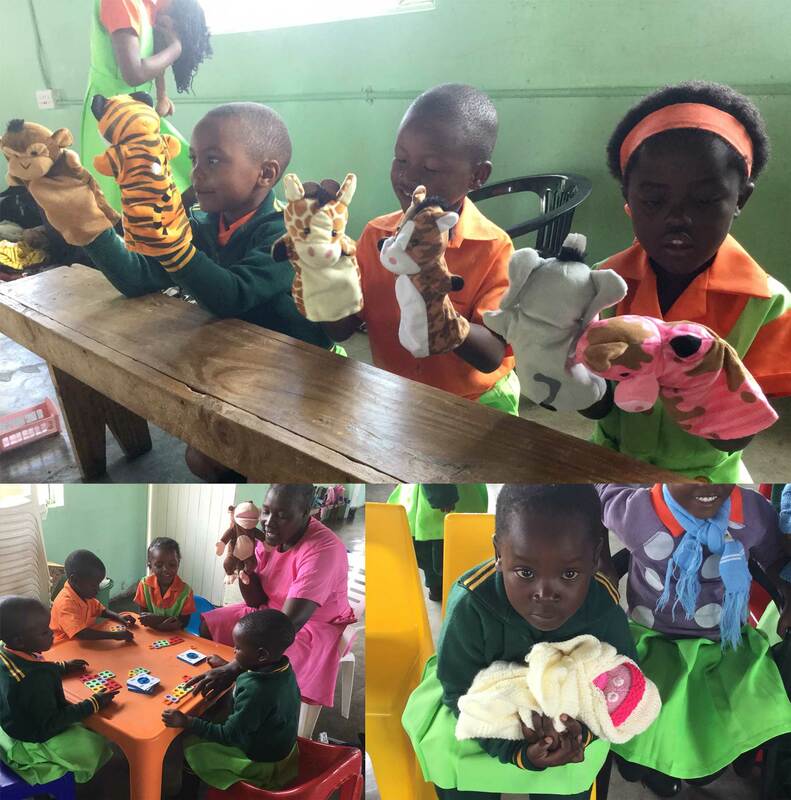 It was lovely to see the children at ECD being able to play with some new toys provided by the members of Focus who make and sell cakes every term specifically for Inkosi Kids. The pushchairs were a great hit as were the new dolls and puppets. Some lovely contacts of the Inspire group also knitted dolls clothes and blankets for the children to play with. Even the teachers were given a puppet to help them teach in a fun way! All that remains for me to say is thank you so much for your monthly contributions to this work and also for the gifts that you send to the children personally. It means such a lot to them. The parents always come to thank us when we are there and I only wish you could all see what a difference you are making in the lives of these children and their families. The play equipment in the playground is being updated as we speak by one of the parents who is not working but has welding gear and volunteered to do it free of charge because he values what the school has done for his two children.Your monthly giving not only provides for the ongoing costs of the school but also healthy snacks for the children and a warm winter tracksuit. Please keep praying for the children that they will keep healthy and flourish socially, emotionally and spiritually. 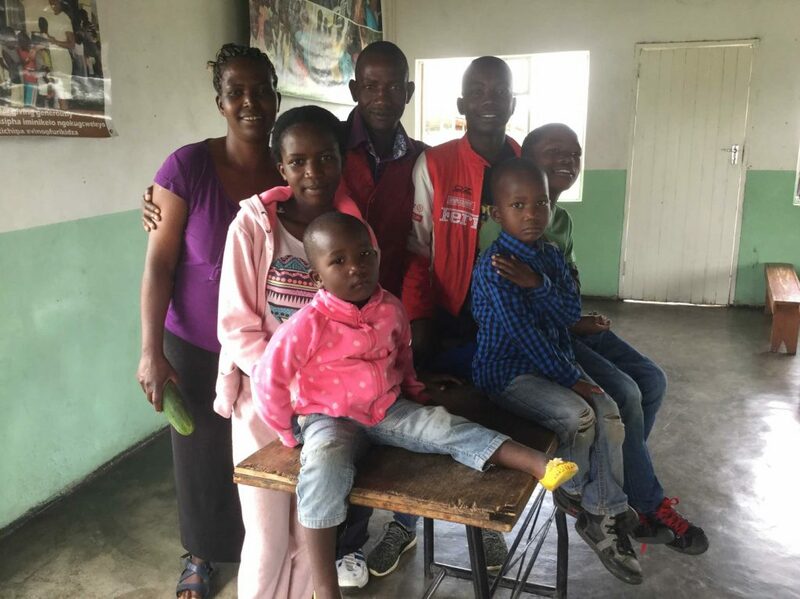 That their families will appreciate what you are doing and make sure their children have what they need to attend school and that the community recognises that God is working in and through His Church. All the gifts you have so generously sent for birthdays and Christmas seem to be getting through so here is a reminder of the address. Please remember to put the child’s full name on the front so that the teachers know who to pass it to without having to open it. Child’s full name c/o Mr & Mrs X Ndlovu Private Box N.E. 12, Northend, Bulawayo, Zimbabwe. Pastor Sithole (pronounced Stolly) and family.